Engine/Moteur. Bernard W 239 4 stroke, mono-cylinder, 5cv at 3600 t/min, alésage; 62mm x Course 60mm x Cylinder 181cm3. 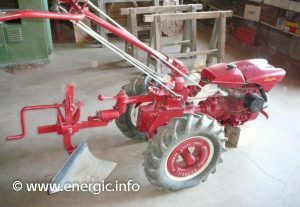 Energic Motoculteur 115 with hoe. Gears. Depending upon the 115 usage, it has 3 gears in 3 ratios so 9 forward gears depending upon the options.Operating through a lever. Differential blockable. 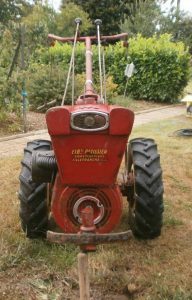 PTO (Prise de force) can be switched from off position to working up to 12 speeds. 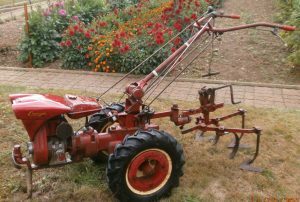 The PTO can be blocked for the use of rotivator and cutting without the use of a spanners. Energic Motoculteur 115 rear view. Fuel consumption. 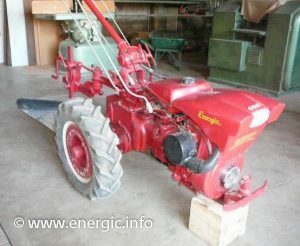 Up to 1 liter of fuel per hour dependent upon working conditions. The tank holds approx.4+ liters. 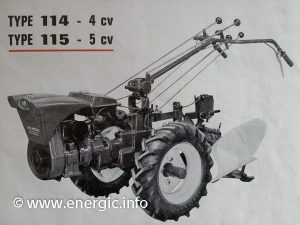 Energic Motoculteur 115 front view.